Woodbridge and the Deben brought out five East Coast boats, and they didn't let a Force 7 stand in the way of a Royal Yacht supper afloat. Well, the East Coast Branch crammed a beauty competition, a dash across the Deben mudflats, a rollicking good pub supper and the logistics of a 'By Appointment' Mess Dinner (prepared at a buoy during a Force 7) into their Bank Holiday weekend. Arriving to spill over the Tidemill Sill at Midday on Saturday (Jacqui-B needs a 'Full Moon' to get over) it was first the Beauty Competition: Put simply it was the War of the Roses. Mike Emmett's 'Black Rose' is a compendium of 16 designs ranging from Fishing Smack to Barge (must have consumed an inordinate supply of beer mats?). Mike is the Oracle of the Deben, almost born a shipwright (perhaps even on a Thames Barge?) he regailed the Party at Tidemill with tales of beautiful yachts (and other beautiful things encountered) on the North Sea. Mark Ashford spent five years tracking down White Rose his Tradewind 35,snatching it from an Italian lawyer, clearly with a similar eye for curves; a perfect fit for his contours. Laura (Dennis Freshwater) and Woodwind (Fred Harris) and their teams arrived and so we crammed 16 into Jacqui-B's cockpit for Pimms before we adjourning to the Anchor. As we crunched our way through an excellent supper, behind the scenes Brent, formerly of RY Britannia, was on a mission:to create a special RY Salmon dish for Dinner at our planned anchorage Ramsholt on Sunday evening (Master Chef eat your heart out). Enlisting the help of the kitchens of several Woodbridge pubs and hotels (a kitchen 'mafia' reminiscent of the camaraderie of George Orwell's Paris) whirring machines were enlisted to refine butter sauces, whites of eggs flour and breadcrumbs. Each was boxed and ready. On Sunday there was talk of Force 7 or even 8 later in the afternoon. 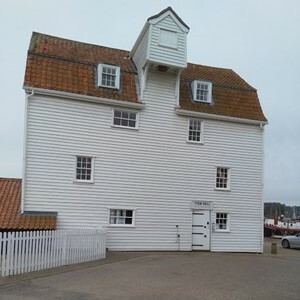 Fred Harris knows everybody round here so Woodwind (which will practically float in a bath) skipped over the sill and sped down to Ramsholt to sort out a group of stout moorings with George the boatman. Grasping the last hour of flood we all made it to the allotted buoys. Phew! The pundits weren't wrong! The howling aftenoon was spent - aboard Jacqui-B preparing the Salmon - aboard the other boats thinking about how to get to dinner - just 40 yards away ,and, of course, bring the other courses. In the event the ingenuity of jackstays wasn't needed as the wind abated just sufficiently for Fred's bold outboard dinghy and Dennis's impressive oarsmen to get across. The cheese course went missing? However, the verdict was: What a feast! We are already planning it again for next year. As we went to bed we reflected on just how many vessels over the years had dined on our spot just off the Saxon Church, perhaps even under that Full Moon, which had got us up to the Tidemill in the first place. Next morning we sailed to cross the bar at HW-3. The team under training did find the mud at Felixstowe Town ,but also how to get off it. As we fanned out from the bar 20 kt South Westerlies seemed (surprisingly) to suit those going North West and South East. A great Bank Holiday. It had been very good to met up for the first time with White Rose from Lowestoft and Laura from Levington.